LANDOVER, Md. — A two-minute drive covering 60 yards ended with QB Aaron Rodgers finding WR Davante Adams for a 10-yard TD pass with just 28 seconds left in the first half, capping a 17-point run for the Packers in the second quarter for a 17-11 halftime lead. The Redskins began the quarter by scoring the first touchdown of the game. After a tackle for loss by B.J. Raji and a solid tackle by Quinten Rollins after a short reception, the Packers defense had a chance to hold the Redskins to a field goal on third-and-11. But QB Kirk Cousins found TE Jordan Reed over the middle, behind Micah Hyde, for a 24-yard TD with 13:02 left in the half. K Dustin Hopkins missed the extra point wide right, so the Redskins led, 11-0. The Packers answered with their first productive drive of the game. 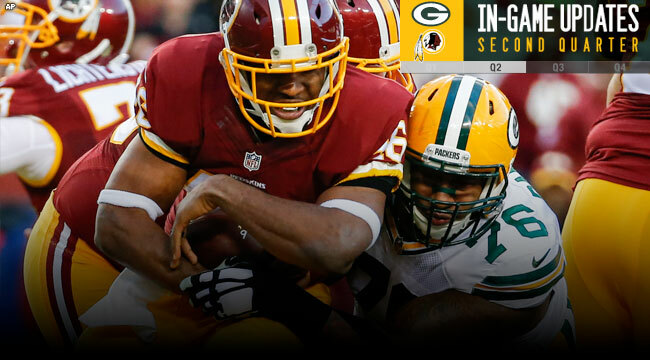 It got started with the Packers getting a first down on a 12-men-on-the-field penalty on the Redskins on third-and-4. On the next snap, Rodgers bought time in the pocket and found WR James Jones deep down the middle for a 34-yard gain to the Washington 35. From there, a 9-yard pass to Adams, a 6-yard pass to RB James Starks, and a 7-yard run on a jet sweep by WR Randall Cobb preceded a 12-yard TD pass to Cobb, when Rodgers once again caught the Redskins with 12 defenders on the field. K Mason Crosby’s extra point pulled the Packers within 11-7 with 9:04 left in the half. The Packers got the ball back quickly on offense. One play after Washington RB Chris Thompson ran for 25 yards into Green Bay territory. Mike Neal sacked Cousins, forcing a fumble that Neal recovered himself at the Green Bay 46. The offense got moving with an 11-yard pass to Cobb on a WR screen and a 9-yard pass to Jones on a slant. A third-and-2 pass for Jones was batted away by CB Quinton Dunbar, though, and the Packers had to settle for a 43-yard FG by Crosby. That got Green Bay within 11-10 with 2:54 left in the half. The successful kick was Crosby’s 17th straight in postseason play, the second-longest streak in league history. The Packers defense responded with a three-and-out, as rookie CB Quinten Rollins put a big hit on WR Jamison Crowder on a third-down pass, separating Crowder from the catch and forcing a Redskins punt. The Packers used two timeouts on that defensive series to get the ball back with 2:22 on the clock, at their own 40. Rodgers went to work, hitting passes of 5 yards to Jones, 6 yards to Starks, 6 and 5 yards to TE Richard Rodgers, and 8 yards to Jones to get to the Washington 30 with 45 seconds left. He then hit Adams for 20 yards down to the 10, making it first-and-goal. On second down, he found Adams in the end zone for the TD with 28 seconds left. Crosby’s extra point gave the Packers their first lead, 17-11.